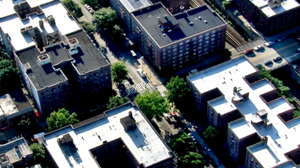 An aerial view of the scene where raids took place in New York is shown. A Denver man arrested and then released yesterday in connection with the New York City terrorism raids had recently traveled to Pakistan before he showed up in New York last Thursday with bomb-making documents, law enforcement officials tell ABC News. The man, whose friends call him Najibullah, was allowed to fly home to Denver and is under very tight surveillance, but several of the men who were arrested, and then released, alongside him, say authorities have it wrong. "He was a very nice person," said Naiz Khan, a coffee cart operator in Manhattan who is an acquaintance of Najibullah and attends the same mosque as him in Flushing, Queens. "He's not dangerous, he's a kid. So he can't be dangerous." Khan, an Afghan native, was arrested Monday but released after four hours with no charges. Authorities raided properties in New York City yesterday in an effort that was intended to disrupt the plans of the terror suspect, whose travels had been tracked by the FBI, according to an official briefed on the raids. "He was being watched and concern grew as he met with a group of individuals in Queens over the weekend," said Congressman Pete King (R-NY). "The FBI went to court late last night for an emergency warrant to conduct the raids this morning." A resident in the neighborhood said there was police activity around 2 a.m. Monday. Officials said the execution of search warrants came after days of surveillance, and NYPD Commissioner Ray Kelly characterized it as part of an "ongoing investigation." Bomb making materials were not found during the raids, authorities told ABC News. King said "there is very good reason to believe that there is a connection to Al Qaeda or to Al Qaeda supports." "[Investigators] would not have moved as quickly as they did if they did not believe there was real potential," King said. The Senate Intel Committee were briefed Monday on the investigation that led to the raids, according to a senior Democratic Senate aide, as were members of the Senate Homeland Security and Government Affairs Committee. Asa Eslocker, Jason Ryan, Jonathan Karl , Zachary Wolf and Steven Portnoy contributed.